The SP can view detailed statistics on VM backup, backup copy and replication job sessions performed by tenants within last 24 hours. Open the Cloud Connect view, in the inventory pane select Last 24 hours or Running. In the working area, double-click the job. Open the Cloud Connect view, in the inventory pane select Last 24 hours or Running. In the working area, right-click the job and select Statistics. Open the Cloud Connect view, in the inventory pane select Last 24 hours or Running. In the working area, select the job and click Statistics on the ribbon. The Statistics option is unavailable for Veeam Agent backup jobs. To learn more, see Veeam Agent Backup Job Statistics. The real-time statistics provides detailed data on job sessions: duration, start and end time, amount of sent and received data and details of the session performance, for example, warnings and errors that have occurred in the process of operation. In addition to overall job statistics, the real-time statistics provides information on each object processed with the job. To view the processing progress for a specific object, select it in the list on the left. To collapse and expand the real-time statistics window, use Hide Details and Show Details buttons at the bottom left corner of the window. At the top of the window, Veeam Backup & Replication displays the number of VMs in the job and the number of processed VMs. Duration — time from the job start till the current moment or job end. Start time — time of the job start. End time — time of the job end. Data sent — amount of data sent from the SP side to the tenant side. Data received — amount of data transferred from the tenant side to the SP side. Rx/Tx — data transfer speed (displayed for currently running jobs only). The pane at the lower left corner shows a list of objects included in the job. For tenant jobs, Veeam Backup & Replication does not display names of objects included in the job. 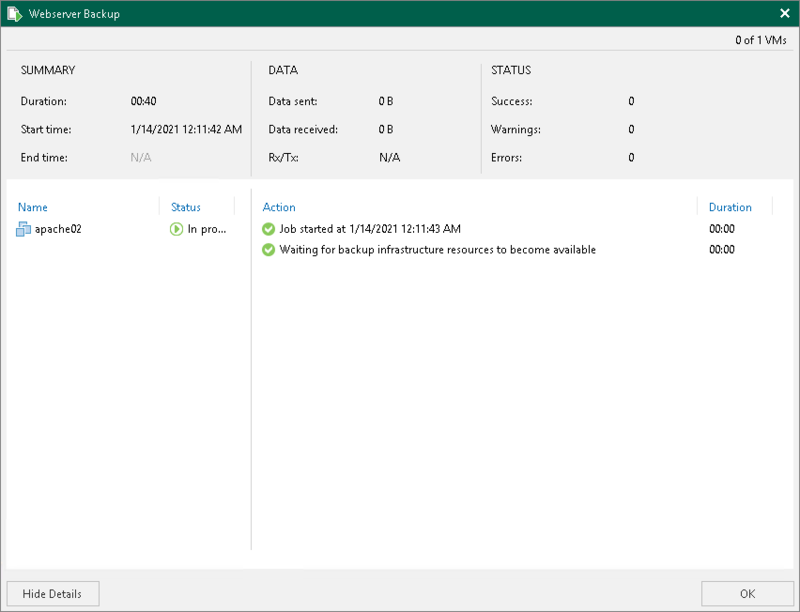 Instead, it displays identifiers for the objects that Veeam Backup & Replication saves in the configuration database. The pane at the lower right corner shows a list of operations performed during the job. To see a list of operations for a specific object included in the job, click the object in the pane on the left. To see a list of operations for the whole job, click anywhere on the blank area in the left pane.